Recently Jo, my wife, and I celebrated our 42nd wedding anniversary. And, like most years, we decided to get-away for at least a long weekend. This year instead of heading to the log cabin in the Smokey mountains or to our favorite B&B in St. Augustine, we decided to do something different. 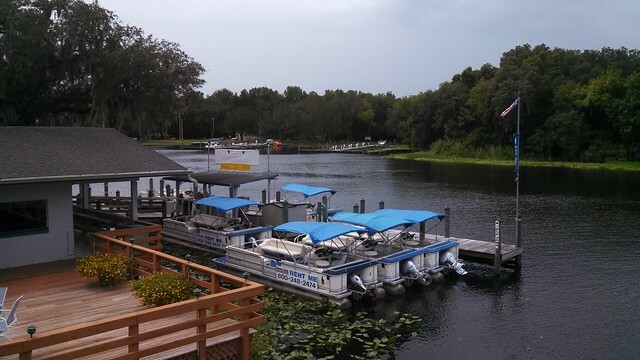 This year we decided to travel to Deland Florida to stay at the Hontoon Landing and Resort Marina situated on the St. Johns River across from Hontoon Island. This is the view from our balcony on the second floor overlooking the boat slips and waterfront. The hotel accommodations were very nice, pleasant, and quiet. The best part, they have pontoon boats for rent. You can see them from the photo. We rented one on Saturday and invited family members and close friends to join. Because we were staying at the hotel our boat rental only cost $99 for an 8 hour rental. The boat motor turned for almost 7 full hours but the price of gas used was only about $35. So we spent around $135 for an 8 hour pontoon rental on the beautiful St. Johns River. I can’t imagine finding a deal like that anywhere else! Since the resort is located on the north end of Hontoon Island, above Blue Springs, we decided to head north first then south later in the afternoon. As you can imagine we weren’t on the trip long when we met our “greeter alligator” on the river, an 8 footer. 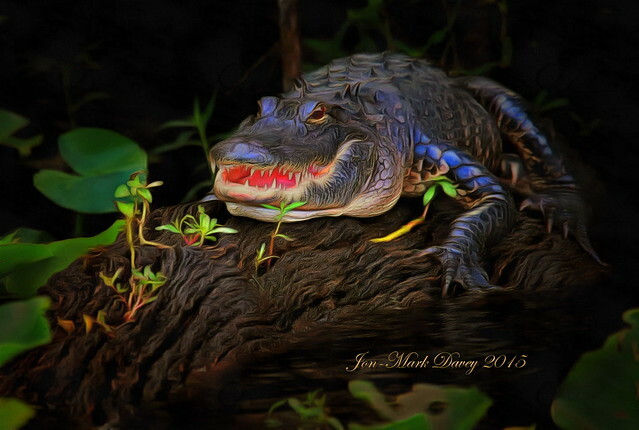 I think because of the lipstick and size of jowls, the ‘gator is a she. She looks aggressive but I just caught her at the end of a big yawn. Even though the day was hot, well, not for the first day of August, we saw fewer than expected alligators. This alligator had a beautiful reflection from the blue sky on her wet skin. Her pink mouth glowed as she closed it finishing a yawn. Alligator skin has wonderful textures that create a pre-historic look when photographed, increased contrast and hand painted over. Even though I’ve lived and explored Florida most of my adult life photographing alligators has not been a big draw for me until the past two or three years since I purchased my Canon 5D Mark III and the Sigma 150-500 lens. This camera rig offers me a safe mechanism for getting some great shots without the fear of being eaten. 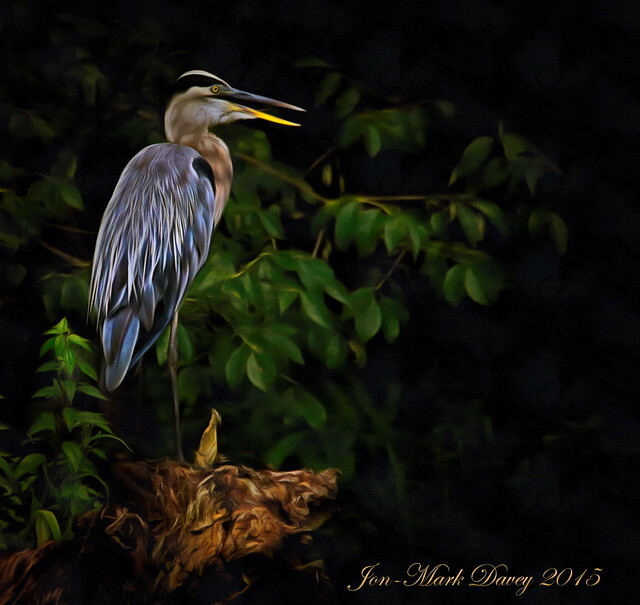 One of my favorite birds to photograph is the Great Blue Heron which we saw many of on our trip. None so beautiful as the one seen here standing high on a tree snag looking for food. When you look at these birds in the wild most of the time new viewers seeing them for the first time mistake them for other birds because they don’t see their beautiful blue feathers, yes they really do have blue feathers. Our friend here was paying far more attention looking for his next meal than worrying about the rain that started trickling down on us humans bobbing around in the water. 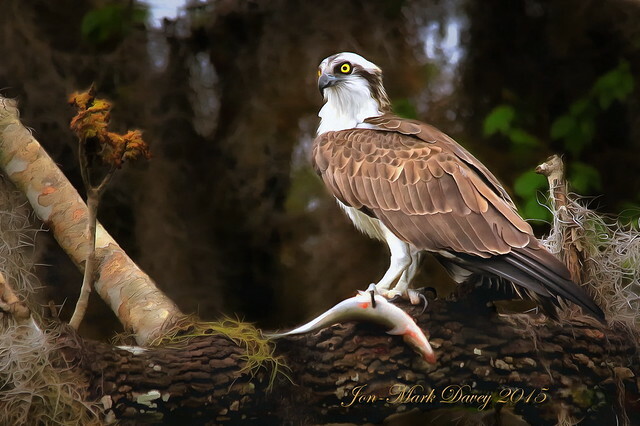 Osprey’s are plentiful in Florida, especially along the waterways. This time of year you can see Osprey’s feeding on top of about any pole or tree anywhere near water. This Osprey had just snagged his meal from the river in front of us as we were floating along. He flew into the tree, settled down then posed with a fine fresh fish meal attached to his talon. About any time I drive along the turnpike in Palm Beach county where the canals follow both sides of the road it’s not uncommon to drive, eye level, with an Osprey as he or she is diving for a catch. For some reason I was hoping that an Eagle would swoop out of the sky and steal the fish so I could get a super shot. No luck. Whitey is the mascot for Hontoon Landing and Resort. 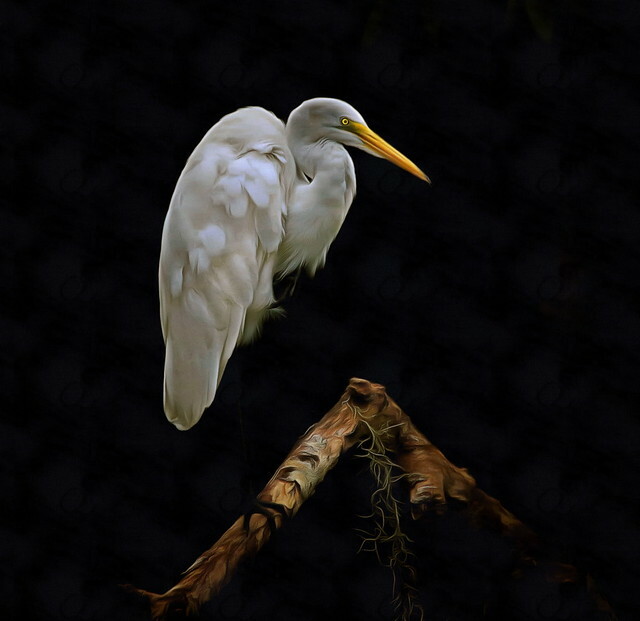 He is second generation Great Egret mascot, his dad, Stumpy, had been there as a fixture for almost 10 years in the mid 2000s. Whitey is one of his last offspring before he was no longer seen over 5 years ago. If you visit the store at the resort they have a beautiful memory book all about Stumpy, the one-legged Egret. Whitey enjoys the company of the staff and visitors and stays pretty close to the marina. This shot was taken as Whitey posed on a beautiful snag across the river from the marina. Great Blue Herons, GBH for short, are beautiful as they stand upright but they are also funny as they live life on the river. This rather large bird is able to reach several feet in front of its body to catch fish but occasionally will get its head well into the water trying to capture a slithering meal. When that head gets wet, a good shake and fluff helps the bird dry off and helps him overcome the disgrace of missing his aquatic escapee. 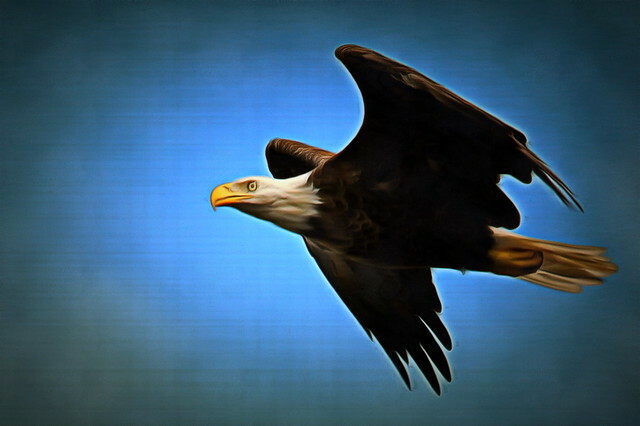 Florida is the #2 state for Eagles, yep, really. Jo and I are avid Eagle watchers and we keep a pretty close eye on the eagle population and active nest maps in Florida. 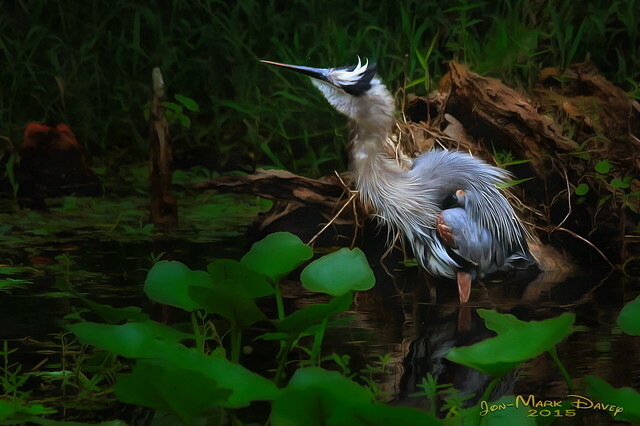 These beautiful birds have been seen almost everywhere in Florida, from downtown Orlando to the Everglades. The most concentrated area for Eagles is Lake Marion just west of Yeehaw Junction. We’ve seen 30 to 40 in one afternoon along Lake Kissimmee prairie, the runoff and wetland areas. St. Johns river is part of that wonderful waterway where Eagles can be expected so we were not surprised when several of these beautiful birds flew past our boat. It was a great trip. The boat was super, the friends and family we had with us were wonderful to have around and it was a perfect day for being in the sun for 8 hours. We were also very fortunate that we pulled up right next to a river restaurant just as the hard rain started. Florida, rain, they go together and are expected. No big deal. Please leave a comment or hit the like button if you liked the photos. Next Post Pointer. Green heron at Peaceful Waters Sanctuary. Great travel log. 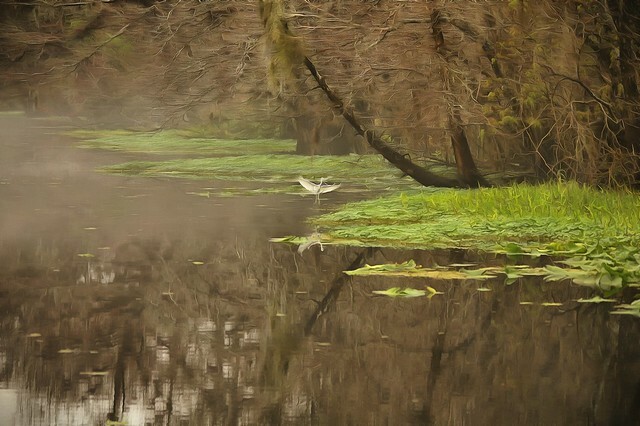 I love the painterly effect of your images. By the way, if you view the alligator picture using a pair of cheap ChromaDepth 3D glasses, the image takes on a 3D effect due to the saturated blues, pinks, and greens. Thanks for the idea with the glasses.